I am an ardent admirer of large-scale works of art, created by New York artists in public spaces. When this art has an impromptu and ephemeral quality all the better! It is here today, maybe not tomorrow. The work of artist Mark Panzarino fits comfortably into this category. For this project he has taken love to the street, or more accurately to the sidewalk. 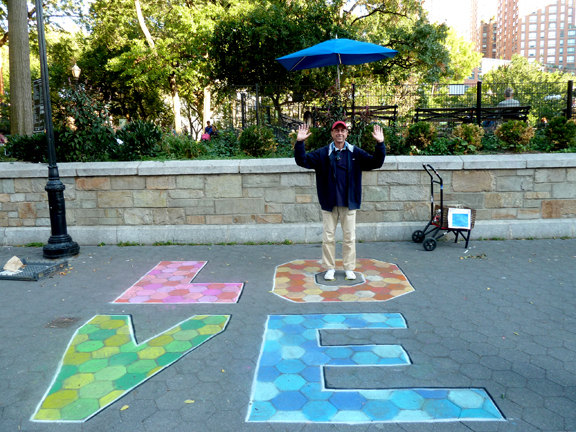 Creatively using the hexagon-shaped paving stones that surround Union Square Park as a starting point, love and the world become more colorful with his chalk work. ‘L’ is for the way you look at me. ‘O’ is for the only one I see. The Farmers Market occupies the plaza around Union Square Park on Mondays, Wednesdays, Fridays and Saturdays. Monday is the day of week when the market is smallest. One Monday, I found Mr. Panzarino off to the side of the farmers’ stands, creating his art message. When he creates larger works, he works during the Market’s off days. To see an example of a linear version of Love click on the ‘O’ photo to be taken to photos at his blog. Union Square Park is the second square on Walk About New York’s Five Squares and a Circle Tour. On any Sunday, Tuesday or Thursday, we may be lucky enough to come across Mr. Panzarino and his art messages made in chalk. 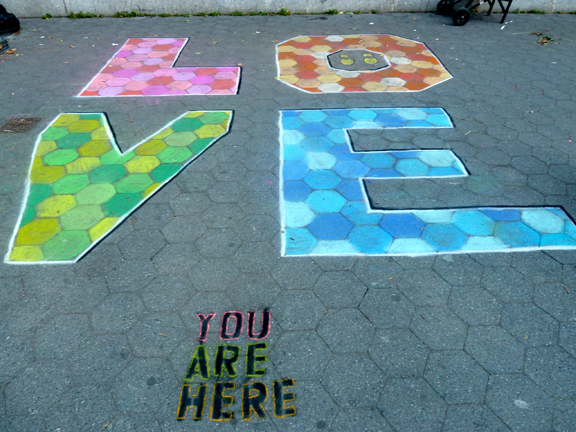 In a nod to our interactive world, Mr. Panzarino as included shoe-print outlines within the negative space of the ‘O.’ Passers-by can participate with the art of love. It is a fun touch! ‘V’ is very, very extraordinary. ‘E’ is even more than anyone that you adore. A bright and cheerful man, Mr. Panzarino trained at the School of American Ballet, the Joffrey Ballet School, the David Howard Dance Center, and the San Francisco Ballet School; and he apprenticed with Miami City Ballet for several seasons. The artist holds the tool of his trade. Mr. Panzarino has choreographed for Steps on Broadway, Texas Dance Theatre, and The Field. Mr. Panzarino’s artwork brings a smile to the faces of many who pass by. Others, lost in their own immediate world and electronic devices, ignore it, even walk on it without noticing. As a testament to Mr. Panarino’s laid-back personality, he is cool with that.